It's tough for people to be lured out of the sun, sand and surf and enticed into a cool, air-conditioned poker room. But when there's an event like a MegaStack, which combines an affordable buy-in with a healthy prize pool, it was no surprise to see so many bums in seats. The first event kicking off proceedings here in Marbella was the €170 MegaStack, which attracted 761 players into Casino Marbella. That created a prize pool of €109,584, and developed a first-place prize worth €20,700. After two one-re-entry starting flights, and three days of poker overall, the man who came out on top was Poland's Michal Janczarski, who by heads-up play against Spain's Rubén Cortés had amassed a huge chip lead. In the final hand, with blinds at 300K/600K, Cortés opened the button to 1.2 million and Janczarski defended to see a 9♣9♦6♠ flop. He checked, and Cortés put out a c-bet of 900K. Janczarski then raised it to 2.4 million, and after some contemplation Cortés shoved. Janczarski couldn't have called any quicker if he tried. When we saw his hand, it was clear why: he'd flopped trips with his Q♣9♥. Cortés read his opponent for a bluff, but his A♠K♠ was in bad shape. The turn was the 5♣ and the river was the 4♠ to end it. This might be the Pole's largest career score to date by far, but Janczarski has had some success in EPT side events over the years. At EPT13 Malta in October 2016, he took down a €220 Pot Limit Omaha - Hi/Lo Turbo for €3,490. Before that, he'd final tabled the €1,050 No Limit Hold'em - Super Hyperturbo at EPT13 Barcelona in August 2016 for €4,890, ultimately busting in seventh. For Cortés, however, the €12,600 he won for second place is only his second ever cash, and the first to eclipse €100. That's what these MegaStacks are all about; bringing new and less experienced players into the game, and giving them a taste of what big tournament poker is all about. 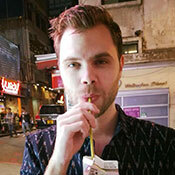 Jack Stanton is a freelance contributor to the PokerStars Blog.